The investigation into who hit a 12-year-old boy on his bike last month is getting a major break as police are revealing only to 7 Action News who they believe is responsible for this terrible crime. he U.S. Marshals say Dominique Amos may be the most heartless fugitive we’ve ever searched for – his actions right here last month, changing a 12 -year-old boys life forever and now they need your help to find justice. He's one of Detroit's Most Wanted. PONTIAC, Mich. (WXYZ) — The investigation into who hit a 12-year-old boy on his bike last month is getting a major break as police are revealing only to 7 Action News who they believe is responsible for this terrible crime. he U.S. Marshals say Dominique Amos may be the most heartless fugitive we’ve ever searched for – his actions right here last month, changing a 12 -year-old boys life forever and now they need your help to find justice. He's one of Detroit's Most Wanted. Racheal Castle saw the flashing lights in front of her window as life as she knew it, and her son as she knew him, quickly slipped away. "So I went running down there and Christian was already gone so they made me identify if it was possible him by his shoe laying in the middle of the road," she said. Christian Castle was riding his bike just outside his home when police say 26-year-old Amos slammed into him with his van. "This is an innocent 12 year old child, this kids joy riding his bike on a January day, not a care in the world and then he’s struck by this person," U.S. Marshal Aaron Garcia said. "He shakes his wheel to detach himself from the child and the bike which fall off down the block. The bike is discovered down the block there, that’s where it fell off." Police say Christian and his bike got lodged into the hood of the van on impact, and Amos did the unthinkable, shaking his wheel and swerving to throw the child off the van and into the road. Christian was in a coma for three weeks and his family says it is still too soon to tell just how severe and permanent the physical and cognitive injuries will be. "It’s extremely unfair and it’s hard like what I see everyday in the same area where this accident happened – it’s hard looking out the window everyday to look at the accident and see it from out my window, its horrible," Christian's aunt, Laura Coburn, said. Police say Amos took off after hitting Christian and was caught on video ditching the van and its keys. 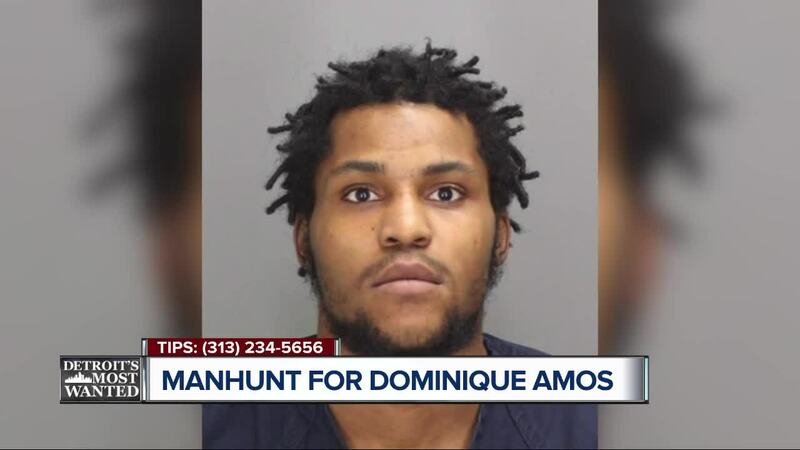 Dominique Amos is 5-feet-11, 150 pounds and is from the Pontiac area but has connections to Chicago. "We need to find this coward, we got information that he may have fled the state instead of coming and fessing up and fixing the problem he takes off and runs, now you’re on our most wanted list and we’re gonna find you," Garcia said. As always, there's a cash reward or any information. You can call them anonymously at 313-234-5656.